Nooria, the capital of the Cerani Empire, is a hotbed of political intrigue. There is a plague sweeping through the empire, marking its victims with a strange pattern, killing many and turning others into mindless killers. At the heart of the empire is a dark secret: the emperor himself has been marked by the pattern and seems doomed. His mother, his courtiers, the vizier and the emperor's imprisoned brother will all play a role in the turmoil to come, as will a girl from the grass plains, sent by her father into the empire as a gift. But the questions remain: who is behind the plague, and who will control the Pattern? 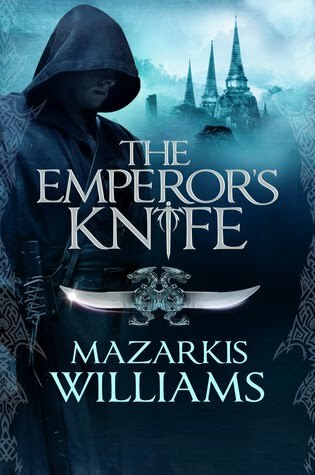 The Emperor's Knife is the first novel in the Knife-Sworn sequence by Mazarkis Williams. It is epic fantasy with a few twists. First off, the setting is far away from the standard medieval European model. At first it seems more influenced by Asian concepts and ideas (comparisons can be made with Chris Wooding's splendid Braided Path trilogy), but the overwhelming influence of the desert on the Empire suggests that Middle-Eastern and African influences may also be in play. Certainly those who feel overloaded with knights, mighty cavalry charges and faux-Norman castles will find much here that is different and indeed refreshing. The book is focused primarily on four characters: the emperor's assassin, Eyul; Prince Sarmin; Mesema, the daughter of a plains-chief; and the vizier, Tuvaini. Other characters are involved, but there is a strong focus on this central quartet, who are developed in some depth as the book proceeds. Tuvaini, in particularly, is a slippery character who doesn't seem to quite match the idea of a hero or villain, whilst Eyul, though shown to be a good man at heart, has done some quite horrific things in the service of the empire. However, Williams doesn't quite fall into the habit of making everyone morally murky or reprehensible (which is getting more than a little bit old in fantasy): Mesema is genuinely a good person and Sarmin is shown - so far - to be someone who has been traumatised by being imprisoned for years since a child, but still retains a sense of right and wrong. The political intrigue is generally well-handled, with both protagonists and antagonists shown to have reasons for their actions and stances. However, one character in particular, the emperor's mother, is not particularly well-developed and seems more of a two-dimensional caricature than any of the other characters in the story, which is disappointing given her influence over the story. The plot shows the unfolding plot against the empire by the master of the Pattern, and there is a fascinating game of cat and mouse that develops as Sarmin discovers he also has the power to touch the Pattern. A minor theme in the book revolves around the use of a game called 'tiles', in which elaborate strategies can be put in place and sprung later on, and the struggle between Sarmin and the Pattern-Master is contrasted against this game (which in turn reflects the political battle in the royal palace). Refreshingly, there is no massive clash of armies here, with the struggle depicted as a battle of wits between those involved...and one in which the dead have their part to play as well. The book has a convincing, doom-laden atmosphere, some fascinating characters and a compelling plot, but is let down a little by some slightly dull moving-pieces-into-place sequences in the books final quarter and a few scenes where it's not entirely clear what's happened: one important meeting between Sarmin and a senior mage of the empire is a little obtuse. However, the book is also commendably stand-alone: most of the book's major storylines are concluded at the end of the novel. Whilst there will be more books in the series, there is no major cliffhanger ending here. The Emperor's Knife (****) is a strong fantasy novel with a fresh setting, rich characters and an enjoyable storyline. It will be published in the UK on 27 October 2011 by Jo Fletcher Books and in the USA on 6 December 2011 by Night Shade Books. This somehow reminds me of Dishonored. Sounds good. Hopefully there will be a paperback edition in 2012.
sounds like a gritty Elantris. which sounds awesome! Hm, sounds good - any non-European inspired setting is generally a change from mainstream fantasy. At any rate, I'm looking forward to giving it a go: Braided Path was good but not great, and this sounds like it has the potential to be even better. Thanks for the review! It's up on Amazon.co.uk for comment now!